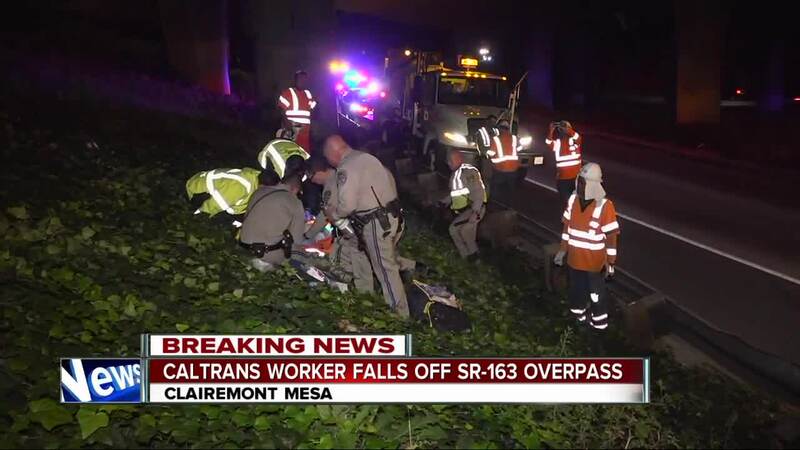 SAN DIEGO (KGTV) - A Caltrans worker died after falling several stories while doing work on state Route 163 Wednesday morning. A Caltrans crew was performing landscaping and street-sweeping on southbound SR-163 when one of the workers fell about 50 feet, landing on a grassy area near the transition road to Interstate 805. 10News learned that William Casdorph, 57, was unresponsive when paramedics arrived. He was taken to the hospital with what were described as major injuries, and later died. Governor Jerry Brown ordered flags to fly at half staff and issued a statement. “Anne and I mourn the loss of Caltrans Highway Maintenance Leadworker William D. Casdorph, a dedicated public servant who worked to make our roads safer for nearly two decades. On behalf of all Californians, we extend our deep condolences to his family, friends and the Caltrans community as they struggle to cope with this sudden loss," said Gov. Brown. Casdorph was based at the Kearny Mesa Maintenance facility in San Diego and was a 19-year veteran of Caltrans, according to the agency. Casdorph is the 189th Caltrans employee to lose his life on the job. Casdorph, a Chula Vista resident, and his wife had three adult daughters. Authorities are investigating the cause of Casdorph’s fall.